Every night children go to sleep, or do they? ”Good night!” is heard all around the globe. Under the water, in the jungle, in burrows, in Antarctica, in the cities, and on other planets. For the special bedtime moments, this is Linda Bondestam’s first book written and illustrated by the artist. 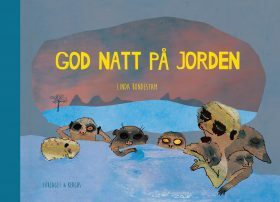 It is a simple and beautiful bedtime story that stands out with its visual storytelling, in Linda’s distinctive choice of colour, varied landscape and surprising species.